by Niall Douglas. Last updated 2008-10-12 00:00:00 +0000 UTC . This page has been accessed 16 times since the 26th March 2019. Sunday 12th October 2008: 5.31pm. Gee, what a few months. This weekend I "finished" the book in the sense that every chapter has been written and contains more or less what will end up in the final book. Of course, some chapters are missing small sections, plus I definitely need some extra graphs and pictures to illustrate myself - then comes the weeks of copy editing when you run through lots of other people's notes on where you're not making sense. However, we are on course for a Christmas dissemination to people from St. Andrews - maybe by the time the printers get back to me with sample copies it may be early 2009. Shortly thereafter it goes to agents for publishing. On that note, I have finally got round to investing in my own server - though it'll be a VPS (Virtual Private Server) for the time being because dedicated ones are horrifyingly out of my budget for the time being. You can get a European based quality one from a quality provider if you search around - I got a deal on a UK based one with 256Mb of RAM, 20Gb of disc space and 300Gb of bandwidth a month for just £5/month. Unlike the cheap & unpredictable OpenVZ VPS's, this is a proper Xen based one where you get total control over absolutely everything. I shall be putting http://www.freeinggrowth.org/ onto it as well as http://www.neocapitalism.org/ and redirecting all email sent to nedprod.com through it. The current hoster for nedprod is lchost.co.uk and they finally told me I could no longer do spam processing on their box as I was shafting everyone elses website from the load. That was fair enough - they have been more than tolerant - but it does mean that I didn't get any email for a week so I now have a nice backlog awaiting me. Having my own server makes a tremendous difference to what I can do. Freeing Growth will need a collaborative cooperative system which allows multiple people to contribute and work upon ideas, code and other stuff. Think of it rather like Wikipedia except that there is a sort of 'peer review' process which occurs before new ideas get incorporated into the whole: one can submit comments & musings a bit like a scratch pad using your mobile phone which you then can coalesce together into suggestions for amendments and/or proposals. In fact, the book proposes precisely the same system except for all creative content & ideas in an entire economy - and from who scratched what & when can it be derived who is most responsible for the genesis of the new idea, and therefore who gets the royalty payments. I can glue together bits of other open source software to achieve this - though it is a shame as it would be an ideal project for my MBS in BIS in UCC, but I would strongly doubt if I could sell it as a viable tool for business. For them, if it can't generate revenue in cold hard immediate cash, it's not a venture. I bought my first car and I am learning how to drive it. 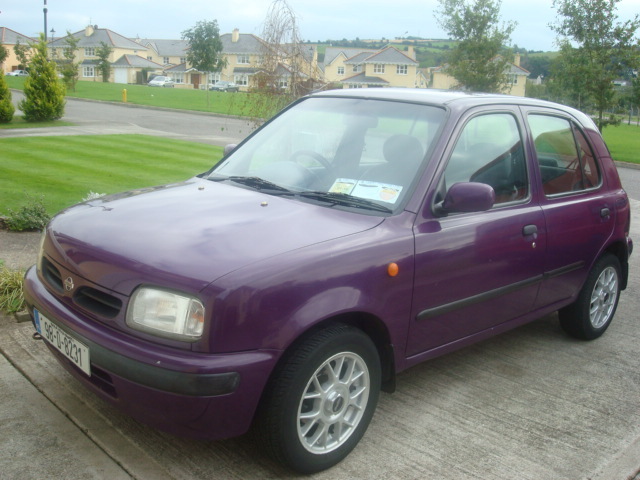 It is a one litre purple 1998 Nissan Micra GX with all the fancy trimmings such as alloy wheels, power steering, central locking and super stereo system. Most of the fancy facilities still work - windscreen wipers can't do intermittent properly and the booming stereo has a loose connection for the left speaker which is annoying. It runs off almost nothing: €10 will take you the ninety miles we do in and out of Cork each week (which works out at about 45mpg). It cost only €1100, though its insurance nearly cost as much as I am a provisional driver. Other than all that, life is okay. I am very tired and very run down, not least because myself & Megan have been arguing fairly heavily since we got here. She is not happy here - and I am sure we can move away back to Britain or further afield after the course is done. As I said to her, she can always leave much sooner than that if she wishes - she hasn't paid her fees yet, so not much money is lost. In the end, I do not know how to do more than I am - I agree that there are too many things tugging on my time such that she feels lonely, but money to feed us has to come from somewhere especially as the stockmarkets are doing so badly. Anyway, time to ring Johanna and talk to her for the first time in many, many weeks - I never have time to talk to anyone much anymore. Be happy!